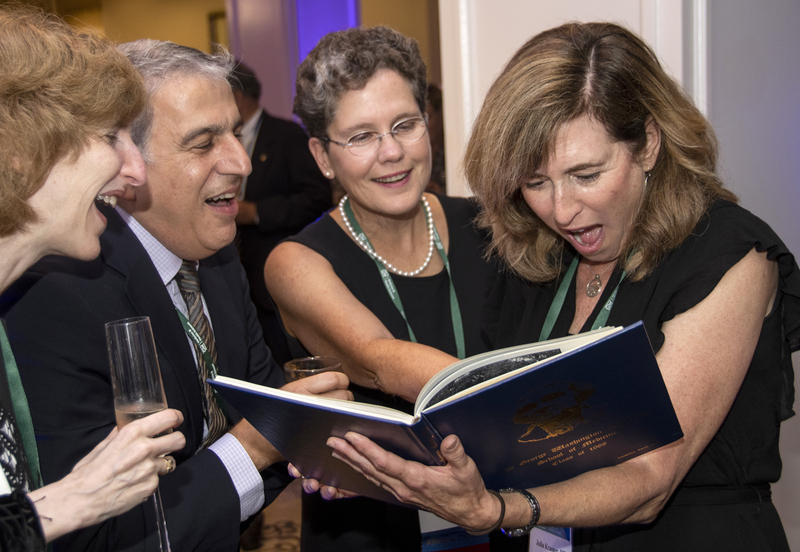 Members of the classes of 1968, 1973, 1978, 1983, 1988, 1993, 1998, and 2008, gathered to reminisce about their medical school days, to learn about the changes the years have brought to medical education, and to rekindle old friendships. The celebration started with the SMHS MD Class of 1968 celebrating its 50th reunion and admission to the H Street Society. For many, the event was the first time they’d seen long-lost classmates since receiving diplomas together on the Lisner Auditorium stage. “The most important part of this weekend is for all of you to get together and see each other and how you’ve evolved,” said Jeffrey S. Akman, MD ’81, RESD ’85, vice president for health affairs, Walter A. Bloedorn Professor of Administrative Medicine, and dean of SMHS. The H Street Society was created to recognize alumni who graduated 50 or more years ago. Named after the site of the medical school until 1973, 1335 H St. NW, the society honors those distinguished alumni and aims to strengthen their connection with the GW community. During the event, members of the class passed around the microphone and shared their journeys since medical school and favorite memories from their time at GW, with many adding what they discovered early in their careers; a medical education from GW put them in not just select company, but also a supportive community. “I remember on the first day, Dean [John] Parks said, ‘We are not here to have the person on your left or the one on your right not make it. We are here to have every single one of you become physicians. We are going to do everything we possibly can to make sure that you all graduate,’ ” Stephen Frye, MD ’68, shared. Following the luncheon, and before alumni stepped out on the town for a Reunion Weekend Kickoff Celebration at the Smithsonian Institution’s Renwick Gallery, attendees compared notes on the medical education experience at SMHS with current students. The event, “Then vs. Now: Student-Alumni Panel Discussion,” was moderated by Lawrence “Bopper” Deyton, MD ’85, MSPH, senior associate dean for clinical public health and Murdock Head Professor of Medicine and Health Policy, and featured three MD alumni and three current students — Alan Cashell, MD ’78, Barbara Meyers, MD ’68, and Richard Ober, MD ’68; and Sreenidihi “Nidhi” Chintalapani, MSII, Daniel Marsden, MSII, and Aarthi Reddy, MSIII. To open the conversation, panelists spoke about a few common themes at SMHS in the past and present. Chief among those was the culture of collaboration and support among the students and faculty. GW’s location in the heart of Washington, D.C., continues to draw students looking to be in the center of the action. Alumni and students alike recalled finding themselves in the midst of historic events, such as rallies and protests in support of the poor or opposition to the war in Vietnam, as well as providing medical support for major events such as presidential inaugurations. A key distinction between the generations, according to Ober, an ophthalmologist living in Arizona, may be found in the way medicine is taught today versus in the past, particularly the lectures. “For the first two years, things were very regimented,” Ober recalled. “We sat in a big lecture hall, it wasn’t like [Ross 117], it was old and dirty with wooden seats.” Those seats, Ober joked, were hard, and students sat there sometimes all day. Much of the pre-clinical is now done in small groups of eight in case-based learning with the aid of standardized patients. “Students work through these cases — the diagnostics, treatment plan, et cetera — as a group,” explained Deyton. What struck him upon his return to GW as a teacher, was the role technology now plays in the classroom. “The students were all looking at their iPads. They’re on the internet, they’re collecting information. We once had to memorize the differential diagnoses and all of the determinants. They don’t have to. They have access to these amazing resources that we encourage them to use.” The whole world, Deyton continued, is wired, and physicians today use technology at the bedside, so medical schools have begun using it in the classroom. The weekend’s activities also included the 7th Annual Frank N. Miller Lecture, named for Frank N. Miller, MD ’48, BS ’43, a professor emeritus of pathology, a dean of students and curricular affairs, and a chair of the Department of Pathology at SMHS from 1944 to 1985. Arthur Sober, MD ’68, BA ’65, AA ’63, professor of dermatology at Harvard Medical School, presented on how to apply principles of quality and safety to create better outcomes for patients. Now, he said, the focus on safe delivery of medical care has moved to the forefront. To have better care quality, he explained, everyone should be empowered to speak up. He said there used to be a very vertical structure, with “the surgeon as king, and the assistant surgeon as the prince” and on down. But a better system is a flat structure that encourages anyone to point out possible missteps. “[It’s] important that this is a non-punitive, non-judgmental culture that you’re trying to develop so people aren’t afraid to speak up and there aren’t consequences for them when bringing to light an issue,” he said. That creates a “second victim,” the provider who caused the problem for the patient, he said. To close out the weekend — following a barbecue luncheon, tours of Ross Hall and the GW Cancer Center, and a reception, awards ceremony, and class dinners Saturday night — attendees said their goodbyes to old classmates and their alma mater with a Sunday Brunch. Each headed back to a different state or city, but with the knowledge that GW will always be there to welcome them home.